Preheat oven to 220°C/425°F. Crush garlic cloves. Remove ends and outer layer of leek then cut into bite-sized pieces. Cut bell peppers into strips. Peel carrots and parsley roots then cut into sticks. Transfer vegetables and crushed garlic into a large bowl. Generously season with salt and pepper. Separate rosemary leaves from stems then mix in with vegetables. Add in olive oil. Mix well until all vegetables are fully coated. 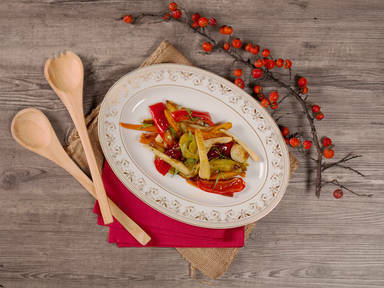 Transfer marinated vegetables to a casserole dish. Roast in a preheated oven at 220°C/425°F for approx. 20 – 30 min. until caramelized and tender. Enjoy with a main course or by itself.